The word on the street is that the fifth and presumably final Indiana Jones movie will be set in the Bermuda Triangle and will be filmed "the old-fashioned way," without all the crazy CGI effects. According to Stuff.co.nz, a script for Indy 5 is in the works, Harrison Ford is ready to go and the whole thing is expected to begin shooting next year. "George [Lucas] and Steven [Spielberg] have been working on a script and it's almost there," a source told the site. "Harrison is on stand-by for filming next year. 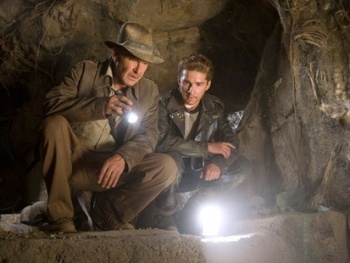 This looks like being an emotional and exciting conclusion to the franchise, with Indy facing his biggest challenge yet." In a bit of good news/bad news for fans of the franchise who were left flat by Kingdom of the Crystal Skull, LaBeouf will be back but the over-the-top CGI silliness won't. "Shia LaBeouf has a central role again as Indy's son," the source added, "but this will be a blockbuster made in the old fashioned way rather than the CGI efforts of the last movie." LaBeouf, as you may recall, took some heat for stinking up the joint as Indie's son Mutt Williams, but he also earned props (at least in my eyes) for manning up and taking responsibility for his part in the half-baked film. "I feel like I dropped the ball on the legacy that people loved and cherished," he said last month. "You can blame it on the writer and you can blame it on Steven [Spielberg]. But the actor's job is to make it come alive and make it work, and I couldn't do it. So that's my fault." Here's hoping that everyone else involved has learned their lesson too.